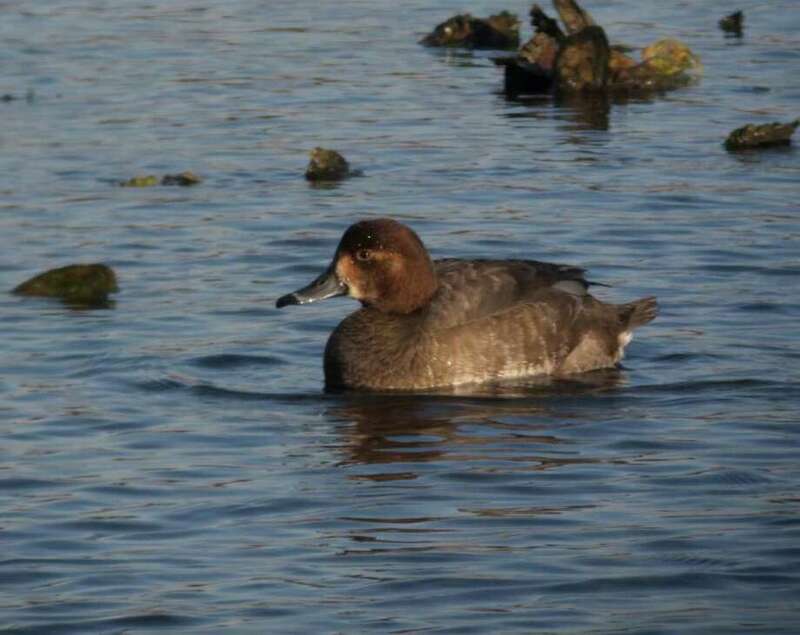 This female Redhead duck in Ash Creek was among the water fowl spotted by teams participating in the annual Audubon Christmas Bird Count. As sure as the swallows return to Capistrano each year, so does the Christmas Bird Count, which this past weekend recorded 110 different species. The 64th annual count in this region, part of the larger National Audubon Society effort, took place over a 24-hour period, concluding at midnight Sunday. The goal is to identify and count each species of bird and record how many of each type are seen in a day, within a 15-mile diameter centered at Westport's Twin Bridges on Route 57. Townsend and Mardi Dickinson were this year's data compilers. The counters are all volunteers and range in ability from "pigeon feeders" to very knowledgeable birders. The more experienced individuals are paired with those of lesser experience and most begin looking for birds at sunrise. More ambitious types go out several hours earlier searching for owls and rails. The results are published in a large report along with input from 1,700 other counts conducted nationwide and throughout the Americas. The concept was initiated 111 years ago and has become longest-running annual census of bird populations in the country. A total of approximately 44,000 birdwatchers serve as counters. To celebrate their achievement and submit their data, the participants gathered at the Connecticut Audubon Society's Birdcraft Museum at 314 Unquowa Road in Fairfield at the conclusion of the day's counting. One of several captains, Charlie Barnard, 66, who led a group of six along the Fairfield shore area, spoke about how he started as a birder. "I just started birding out of curiosity as a kid of 10. Fifty-six years later and I'm still doing it. I initially wanted to know bird names, then they became intriguing as I associated the birds with the places from which they'd migrated. It appeals to your imagination. To see a bird bred in the Arctic and bound for South America and to catch him on the way is really interesting." His group started at 7 a.m. and finished at 4:30 p.m. "It was a challenge trying to get to the end of Penfield Reef at low tide. We couldn't make it today as the northeastern wind was pushing the tide into normally uncovered spots," he said. "We saw large numbers of water fowl -- not only a lot of species but also a lot of individual birds," Barnard said. 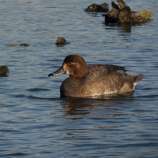 "For instance, we saw 400 Common Goldeneye, a small duck that's a winter resident down here. We saw one Northern Gannett, which normally nests in rock cliffs in the Canadian maritime area." As to the process, Barnard said he'll count to 100 birds and then overlay that image on the remaining flock to get a fairly accurate estimate. Numbers are recorded on field cards, which list 406 different species that historically have been recorded in Connecticut. Two of Barnard's team members were James Purcell, 14, a Fairfield Ludlowe High School student, and Alex Burdo, 14, an Unquowa School student. Purcell said, "When I was 7, I got a bird guide in the mail from the Audubon Society, got hooked and started going out bird watching. Then I heard about the Connecticut Bird List, an online forum that provides info about where certain species can be found in the state. I started going birding all over Connecticut and then joined the count last year." Breasted Nuthatch at a person's feeder was also cool. My top favorite bird of the day was an Ipswich Savannah, a sparrow that only breeds in Sable Island in Canada." Townsend Dickinson called out each species' name from a field card to the groups and they would let him know if they had seen one or not. Often, he would ask where and more detail. The group had noted several species that were not on the list, including an Eider, Barnacle Goose and Cackling Goose. Each will need to be further documented. "I loved being out there today and collaborating with other birders," said Purcell, "but especially seeing all the different birds."